B&Q offers click & collect on selected products with next day pickup if the order is placed before 6pm. It’s unusual for the service to have its own CTA on the product page rather than a general ‘Add to basket’ button with the delivery options hammered out in the checkout process. The CTA appears even when products aren’t available for in-store collection, presumably to let customers know that the service is potentially available on alternative products. Shoppers must then select their store using a postcode lookup tool or IP address, before heading to the shopping basket. At the shopping basket shoppers can still opt to switch to home delivery rather than in-store collection, then must create an account before completing a purchase. Screwfix markets its click & collect service in the top nav and on individual products within the results page. Products are apparently available within five minutes, which is a top-notch level of service. As with B&Q, product pages have two CTAs, one for delivery and one for in-store collection. There’s also a link to allow shoppers to check the stock in their local store. Once a customer has selected click & collect they have to search for their store prior to the checkout. However there is no ‘find me’ option, it has to be done via a postcode lookup. At the next screen Screwfix gives a range of store options and details the stock levels. It also notifies shoppers that the stock will only be reserved once the purchase has been completed. This information is then reiterated at the shopping basket. I wasn’t able to test the five-minute promise as I didn’t want to enter my card details. Homebase doesn’t mention click & collect within the top nav, but there is a logo in the product listings. There is also only one ‘Add to basket’ CTA on the product page, though shoppers are able to check the stock within their area. Customers then select their delivery method within the shopping basket. As an aside, I love the big buttons on Homebase’s site. At the next stage users enter their postcode or address, but then there’s no list of stores to choose from, it simply defaults to the nearest one. The item is then available for collecting within three hours, or from 10am the following day. Argos makes no mention of its click & collect service in its top nav or within the product listings. The range of options on the product page is also slightly confusing at first. There are two CTAs (‘Buy & Reserve’ and ‘Turn on 1 Click Reserve’), plus two tabs for delivery options (‘Collection’ and ‘Delivery’). I selected ‘Buy & Reserve’ within the Collection tab, but then at the shopping basket I had to again select which delivery option I wanted. Shoppers have to enter their postcode to find out their local store or whether delivery is available. If you choose in-store collection a pop-up appears with details of five local stores, as well as stock availability. Some stores offer immediate collection while others offer next-day availability. It’s then up to customers to decide how urgently they need it. At this stage Argos differs from other retailers in that it doesn’t require payment details. Shoppers need only enter an email address and phone number to be notified when the item is ready. Payment is then taken in-store. John Lewis markets its click & collect service on its product pages, but only for items that are available for delivery via this method. As a result, shoppers may not realise that click & collect is potentially available on alternative products. Delivery options are reiterated at the shopping basket, alongside some copy informing customers that click & collect is free from both John Lewis and Waitrose stores. Customers must then choose their preferred delivery option at the first stage of the checkout, with in-store collection available from 2pm the following day. Shoppers can also pick up their order from Collect+ locations. The order must be paid for before it is confirmed and dispatched to the store. 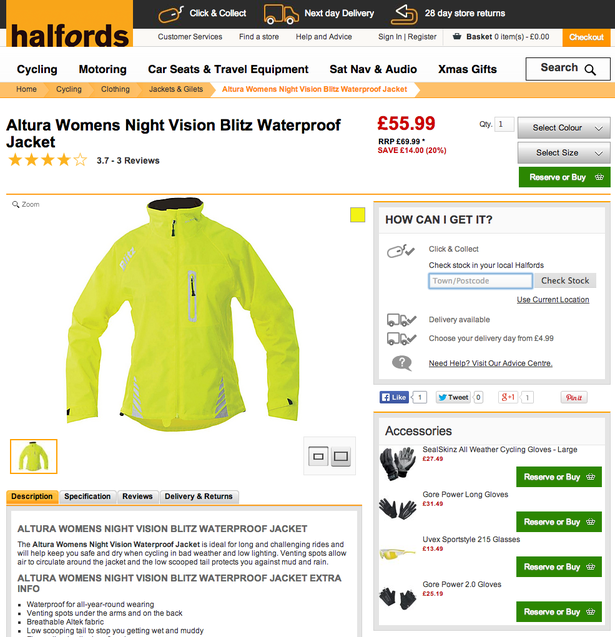 Click & collect accounts for more than 80% of Halfords’ online sales and it’s advertised prominently across the website. Unfortunately there is a confusing array of CTAs on each product page, meaning that the click & collect stock checker is easy to overlook. This is an excellent level of service, only I have no idea where the Kilburn store is so had to open a new tab to look in Google Maps. Customers must then choose in-store collection at the shopping basket, before reserving their item with an email address and phone number. Payment is taken in-store. Selfridges began its click & collect service in May 2013 and expected it to account for at least 25% of all online orders. The department store also opened a drive-thru collection service at its London Oxford Street store. Selfridges’ new £40m website mentions click & collect at the top of the page, but it’s not mentioned again until the shopper is selecting their delivery option at the first page of the checkout. As Selfridges only has four stores the process should be quite simple, however it creates an unnecessary layer of complication by adding in an extra screen where the shopper has to choose the specific date they wish to collect the item. Payment is then taken before the order is complete, though strangely there hasn’t yet been any mention of the exact time that I’ll be able to collect my shoes. Schuh promotes its ‘FREE!’ delivery options on the homepage, and also has a stock checker CTA. The delivery method is then selected from a dropdown menu at the shopping basket, but customers choose their local store within the checkout. Shoppers have to pay online before the order is processed for collection in-store. Although these retailers all deal in different types of consumer goods, it’s interesting that there’s little consistency between the user journeys. Some allow customers to choose click & collect at the product page, though it’s more common for sites to show shipping options at the shopping basket or within the checkout. 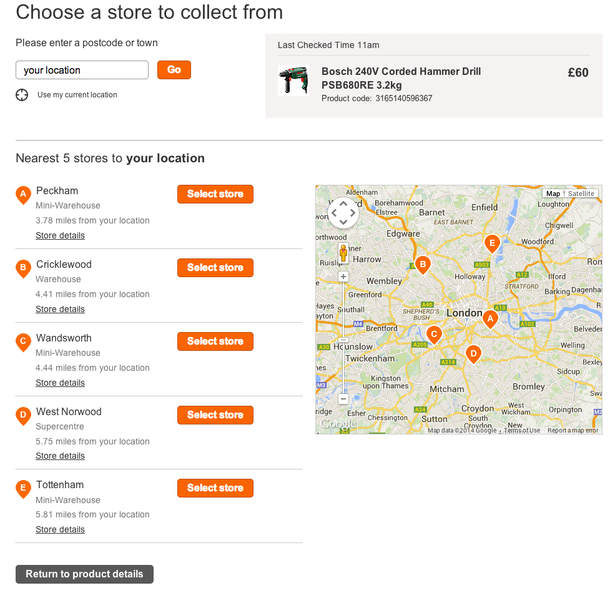 B&Q has made a business decision to make its click & collect service more prominent as part of the new site design, and I wouldn’t be surprised if more multichannel retailers go down this same route as in-store collection becomes more popular. In order to offer the best level of service retailers need to have a single view of their stock levels, so shoppers can collect their item within an hour or two of placing an order online. Screwfix offers pick up within five minutes, which sets a high benchmark for all other retailers to aspire towards. One final aspect worth noting is the different payments models. Most of these retailers take payment as part of the online checkout, but Argos and Halfords require people to pay in-store. I haven’t seen any research to suggest that either option is preferable to shoppers, but personally I would expect to pay online so that I just have to drop in and collect my purchase. Digital Psychology is a relatively new discipline that combines theory from the worlds of behavioural economics, psychology and digital marketing to create digital communications that are compelling and persuasive to our unconscious minds. The great thing about combining social science theory with contemporary digital best practise is that marketers are able to hypothesise and test assumptions on a statistically significant number of subjects (customers) in a relatively short period of time. Also, through the medium of A/B and multivariate testing, put the lessons learnt into practise almost immediately. This means that there should be some excellent proven examples of digital psychology out there on the web, and I’ve taken the opportunity to rank what I think are the top performers. From small companies, to international giants, all those listed are employing some pretty clever tricks from the digital psychology toolkit.